- Provide free cleft surgery to hundreds of thousands of poor children in developing countries. - Train doctors and medical professionals in over eighty countries. - Treat the “whole child” with comprehensive, total rehabilitative care including: speech therapy, general dentistry and orthodontics. To help this wonderful organization, M.R. Mathias and L.M. 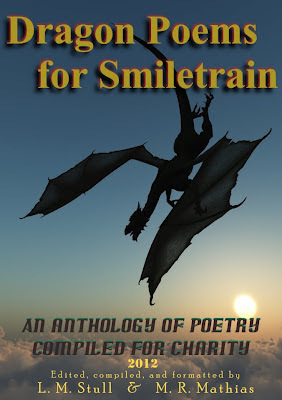 Stull hosted a wonderful contest for poems about dragons. They have now collected all the entries into an eclectic collection and all proceeds from the book will go towards Smiletrain and their amazing efforts in helping children. So spare a look if you can at their wonderful website and for buying your copy of this collection for Kindle you can check it out HERE. Great cause. Good on you M.R.